A MINI township is set to take shape on the southwestern end of Penang island in three years, if Hunza Properties Bhd's (HBP) plan takes off. The developer, which recently bought about 6.48ha land in Bayan Baru for RM82 million, is eyeing a multi-billion ringgit integrated development, which will serve as a mini city, executive chairman Datuk Khor Teng Tong said yesterday. 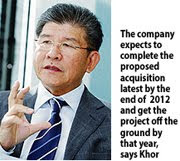 "We expect to complete the proposed acquisition latest by the end of our 2012 fiscal year and hope to get the project off the ground in that year," he told a media briefing in Penang announcing HBP's 2010 second quarter earnings. The group's financial year ends on June 30. Khor said HPB is currently looking to relocate an estimated 800 squatter households occupying the land in Bayan Baru. "I am confident we can find a solution to the relocation issue," Khor said, add-ing that Hunza is well-versed with the issue through experience in previous projects. The company is now looking for professionals like architects to develop the proposed mini city. "We need the expertise of both local and foreign consultants," he added, saying that an international performing arts centre, residential high-rises and serviced apartments may be some of the features in the new development. On the financial front, Khor said the gearing ratio of HPB is currently at a minimum level. "The rights issue exercise currently being carried out will further strengthen our financial position. "Added to this is the anticipated strong cash inflow from the current level of over RM200 million of unbilled sales," he said. For the second quarter ended December 31 2009, the company recorded RM59.4 million in revenue and RM13 million in profit after tax. Revenue more than doubled while net profit surged 92 per cent from the same period in 2008. HO HUP Construction Co Bhd aims to make at least RM300 million in annual revenue for the next 10 years, driven by developments at its 24ha land in Bukit Jalil, Kuala Lumpur. 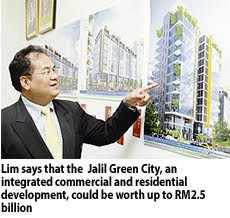 The company is planning what is known as Jalil Green City, an integrated commercial and residential development that could be worth up to RM2.5 billion. Its group managing director Lim Chin Choy said the original development plan has been revised. Jalil City will now have six high-end residential towers, three Grade-A MSC-status office buildings, a 12-storey office block and a 1.5 million sq ft shopping mall. The development will also comprise five-to-eight-storey shop offices as well as recreational and green facilities. Jalil City is targeted to be an environment friendly and sustainable development. The buildings will incorporate green features. Previously, the plan was to build conventional-type shop-offices housed in four- to eight-storey buildings, a hypermarket, a piazza, 2,000 units of condominiums and a Grade A office building. "We want to make this the best development for Klang Valley. I will aim for three awards for the project for best integrated commercial development, best high-rise residential development and best shop-office development," Lim told Business Times in an interview in Kuala Lumpur recently. Lim, formerly the chief executive officer (CEO) of property developer Magna Prima Bhd, took over Ho Hup on June 1 2009. For the nine months to September 30 2009, it posted a net loss of RM23.8 million. Lim has been spearheading Ho Hup's corporate restructuring to reduce debt, inject new capital and generate revenue. The residential property market is expected to thrive this year as it rides on the surge in demand, particularly in the medium-high segment, says MIDF Amanah Investment Bank Bhd. It said although new property launches in key cities like Kuala Lumpur, Johor Baru and Penang are less encouraging, the expected stronger economy this year should see the launch of previously delayed projects. "Our survey with key developers shows that purchasing interest remained high with take-up rates of new projects at an average of 70 per cent just from private previews or first few days of the launch," MIDF Amanah said in its research note. Despite signs of sectoral revival, it said the property sector still lacks foreign participation to drive its marketability. More measures are needed to secure foreign participation, apart from the present tax incentives and MSC-status benefits. The investment bank maintained its "neutral" call on the property sector as it expects property sales to undergo a minor correction when Bank Negara Malaysia begins to tighten monetary policy and foreign funds start withdrawing should the economic recovery lose its momentum. "However, we believe local investors will cushion the downside as property buyers will seize any buying opportunity. We continue to favour counters with exposure to the mid- to -high-end residential market and industrial developments," it said. MIDF Amanah said medium- and high-end properties benefit from an economic recovery as consumer purchasing power increases and participation in the small- and medium-scale property sector also increases from business expansion. The residential sector remains a favourite for hedging purposes, it added. DIGITAL city, i-City, has received the required licences from the Malaysian Communications and Multimedia Commission (MCMC) that would allow it to operate as a telco-neutral development. The licences were presented to the developer of i-City by Deputy Minister of Information, Communication and Culture Senator Heng Seai Kie. The Government established MCMC under the Ministry of Information, Communications and Culture to oversee the regulatory framework for the convergence of telecommunication, broadcasting and online activities, and therefore as the first networked development in the country, i-City naturally comes under the purview of MCMC. "When i-City development plans were first presented to MCMC a few years ago, we were very supportive as we have a Malaysian developer that is leading the way to implement many of the ideas and concepts that MCMC were set up to regulate. I would like to congratulate i-City for what they have achieved," Heng said. He commended i-City as a development that has provided the right infrastructure, facilities and services for digital storage and digital distribution, including in the plans to promote i-City as a tourism destination, working on digital lights and digital content. i-City is a 28.8ha commercial development in Shah Alam where digital technology has been integrated into the fabric of the development, designating i-City as both a MSC Cybercentre as well as a tourism destination. The whole i-City hosts a large Cisco network with both high speed as well as redundant broadband. There is hope yet for those who bought bungalow lots at the abandoned Emville Golf Resort (EGR) in Dengkil more than 10 years ago as the Gema Padu Group, developers of Kota Warisan in Dengkil, would be reviving the project. When EGR was first launched in 1998, the project located next to the Bukit Unggul Golf Resort in Dengkil, promised a refreshing treat for avid golfers as the course provided contrasting appeal from the first nine and the second nine holes. The first nine or Pine Nine set within a garden concept and dotted with flower beds and pine trees and the second nine or Orchard Nine allowed golfers to experience a scenic route through the fairways with nine different types of fruit trees planted on either side. Designed by Bobby Lim, Malaysia’s first golf professional, the course was poised to inspire seasoned golfers. However, buyers dreams for a resort-style life away from the city were shattered when the developers Emville Sdn Bhd abandoned the project as the company went into liquidation eight years ago. Twelve years on, the more than 700 buyers of the project’s bungalow lots are feeling a little optimistic now as the Gema Padu Group has promised that the EGR is expected to be completed within three years. The EGR is now in an abandoned state with overgrown lalang and almost bare hillslopes where some half-completed bungalow structures still stand. The only part which has been preserved is the golf course and the clubhouse. However, all this is expected to change with the signing of a Memorandum of Understanding (MOU) recently at the EGR between Gema Padu Group and Aman Golf School (AGS) which will see to the administration of the golf course. The MOU was signed between AGS managing director Sharifah Mordiah Sayeed Alwie and Gema Padu Sdn Bhd director Lee Kuan Yong. 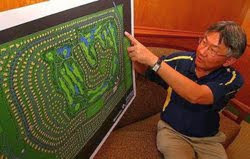 “The clubhouse is still standing and the golf course with its first nine would be rehabilitated and the whole area would be transformed into an exclusive area, all within the next three years,” said Lee. For exclusivity: Lee explaning the rehabilitation programme for the Emville Golf Resort. Sharifah, meanwhile, said that AGS is presently located at the Bukit Beruntung Golf and Country Resort and would be moving their business to EGR once the project is completed. The AGS, registered with the Education Ministry, was established in 2002 to train young people with talent to become professional golfers. “The AGS is equipped to facilitate the students’ training programme. We coach students to reach a certain benchmark of professional golfing,” said Sharifah. In conjunction with the signing of the MOU, more than 120 golfers from both the private and government sectors and members of the media were invited for a friendly round of golf at the Bukit Unggul Golf and Country Resort. KUALA LUMPUR: An online version of the Housing and Local Government’s One-Stop Centre (OSC) has been launched to allow for round-the-clock Internet submission of applications for development projects. These would include applications for government projects and the build-then-sell projects, minister Datuk Seri Kong Cho Ha said. Kong said the online system would allow people to submit their applications anytime at their own convenience without having to queue at the ministry’s counter. “By introducing the OSC in 2007, we were able to reduce the processing time from two years to the current 120 days or less. “With the online version of the system, we are taking it a step further and we hope it will also cut the processing time even shorter,” he told a press conference after launching the OSC online system here yesterday. From April 2007 to Dec 31 last year, Kong said 91,163 such applications had been submitted to the OSC. “Of all the applications, 59,665 or 65.4% have been approved while 7,172 or 7.9% are still under consideration, and 24,044 or 26.4% will either be cancelled, modified or rejected,” he said. He added that the number of approved applications had also increased by 10.4% to 83.8% last year over 2008. “Of the total 103 local councils in Peninsular Malaysia, 64 of them or 62% have managed to handle applications above the national average, which is 89.3%,” he said. He revealed that 18 local councils had started using the OSC online system, which costs RM3.8mil, since last year. All other local councils were expected to use the system by this year. “The implementation of OSC online is in line with the Government’s aim for all its agencies, including local councils, to use information and communication technology as a medium to deal with customers.